It's past 1 hour since berbuka time. I just had a small cup of bubur caca while waiting for hubby to come home. Hmm..it's been like this since then. But, wat to do. He works with japanese yg ske sgt keje T_T..
Called him just now and he's still outside of the office...and it took him 1 hour to reach office back and haf and hour to reach home. So, can u guys imagine at wat time only he cud have his proper meal??? I'm sure you guys have ur own unofficial photographer rite?? I had my own too..He is my cousin who is 17 with a very high passion in photography. He has everything that a photographer might have. U just name it and u jaw will drop open=p haha.. 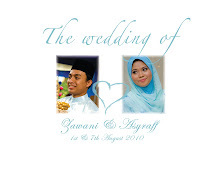 I used his photos to be uploaded in here and also my fb. Hmm...I think gamba2 unofficial are somehow important cz by the time photos from OP dpt, u r already pengantin basi=p My mom siap cuci all the photos lg cz cannot wait for the OP. hehe..
Oh crap! 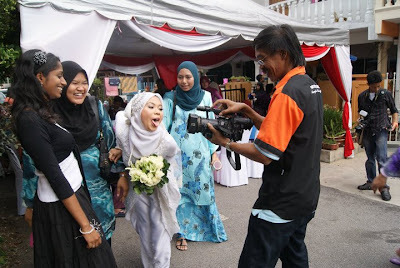 I cudn't find any photos of me with him (lumrah photographer xde dlm gambar).. But, I managed to find one..hihi.. Spotted!Ajid at the most right..checking his hp kot..